“THANK YOU! Murray for a beautiful piece of craftsmanship! I ordered the FUNDY board and am IMMENSELY PLEASED with it ! Have friends over often to play, and they never stop commenting on how beautiful and playable this board is. If anyone visiting this page is considering a Muzzie board,I assure you, you will not be disappointed!” – L.G. Grande Prairie, AB. “YAY..thank you!!!! We are all so excited to have such a quality board …many happy memories to look forward to. Merry Christmas!” – L.B. “Murray, My husband and I ordered a board 2 years ago from you and LOVE IT. Since then my sister and family purchased one from you, and now we want to get one for our parents! “Just wanted to say that I received my shipment today. My son is going to be over the moon Christmas morning when he sees this board. I want to congratulate you on a beautiful product. It is more beautiful than I anticipated, your website does not do these products justice. Thank you.” – M.C. “Gorgeous board my wife got me for Christmas. played several games with her mother last night and had a great time! Thanks for making a great board and for getting it to the States in time for Christmas!” – T.B. “I am really looking forward to playing the board and finding it a place of honor on my game room wall! Thanks again!” – T.W. 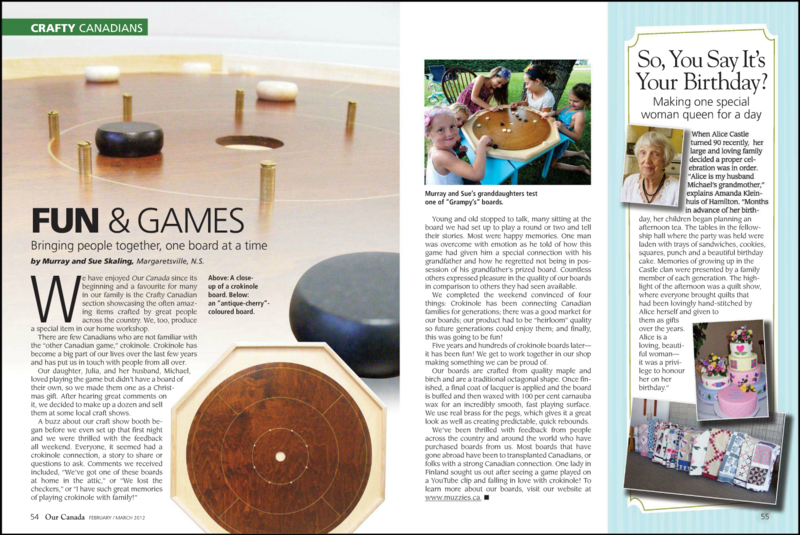 “Thank you Muzzies for my fantastic Crokinole board – pure quality! I love it and so does everyone else – a star attraction and one of my best investments by far!! !” – M.D., Wales.